Mexico City was the first Olympics to be broadcast live and in color. Sports has always been a platform for innovation in television, but the 1968 Mexico City Summer Games pushed production even further. Imagine watching a game today that wasn’t live, that wasn’t in color and that did not feature slow-motion replay. Sports fans can thank the 1968 Olympic Games for those advances. In the years leading up to those Summer Games, the three leading American broadcast networks, ABC, CBS and NBC, were at the forefront of transitioning from radio to TV. By 1960 the U.S. was the leading country with number of sets in use, according to a report on radio and television from 1950-1960 in the United Nations Educational, Scientific and Cultural Organization. “Between 1960 and 1965, the average number of daily viewing hours went up to 23 minutes per TV household, the biggest jump in any five-year period since 1950,” according to Britannica.com. Part of that steady increase was due to sports drawing viewers. While the amount of televised sports in America had steadily increased from the 1930s to 1960s, the attention in that last decade shifted to the Olympic Games. All three major broadcasting networks pursued the broadcast rights. “Back in 1960, CBS was the first American network to pay for the broadcast rights to the (Summer) Olympics, paying only $394,000 at the time,” according to NewscastStudio. However, four years later ABC earned the bidding rights to televise the winter and summer games in 1964 and 1968. To televise its first Olympic Games “ABC paid $7 million total for rights to the 1968 Winter and Summer Olympics: $2.5 million for Grenoble (France) and $4.5 million for Mexico City,” Vogan wrote. However, securing the rights to broadcast the Mexico City Games didn’t come easily. “Desperate to maintain a foothold in sports broadcasting, NBC reportedly told the Mexico City OOC (Olympic Organization Committee) that it would top any bid ABC issued,” Vogan said. Arledge, along with Robert Trachinger, an ABC Sports executive, is credited with creating the “first hand-held TV camera and slow-motion videotape system that allowed television viewers to watch replays of exciting sports plays,” according to the San Diego Union-Tribune. “The replay feature forever changed sports broadcasting when it was introduced in the early 1960s,” according to the San Diego Union Tribune. ABC used 250 staff on site, aired 72 hours of coverage with eight in prime time and broadcasted every event, except bobsled, in color at the Grenoble Games. “ABC also utilized its nearly exhaustive camera positions to offer start-to-finish coverage of downhill skiing and used split-screen technology to compare skiers’ performance to their competitors’ earlier runs,” Vogan said. 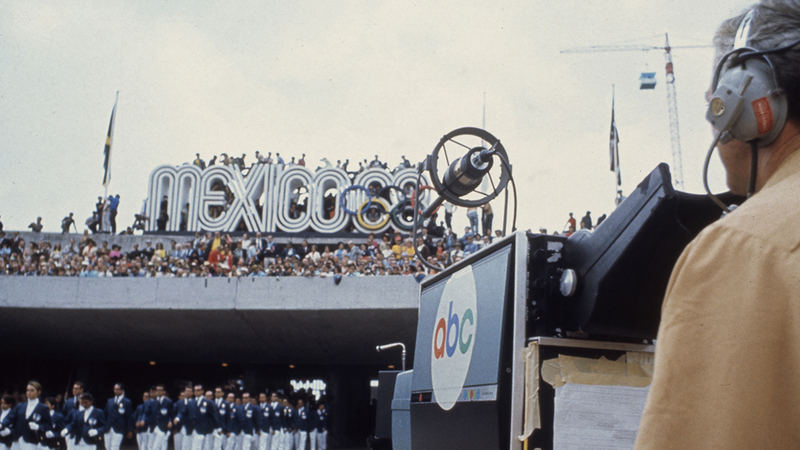 When ABC transitioned to the Mexico City Games that same year, their broadcasting improved. With only a 1-hour time difference and NASA’s launch of Intelsat 3 telecommunications satellite weeks before, ABC increased the amount of its live coverage and ensure global coverage from Mexico City. “Utilizing cameras in helicopters and on a 225-foot crane above the central stadium, and a microphone inside the Olympic flame to capture the whooshing sound of it being lit,” Vogan said. Although ABC only carried 44 total hours of coverage they had 10 in prime time. “ABC called Mexico City the ‘most extensive and complicated coverage of any event in TV history,’” Vogan wrote. The technological advances ABC made in its Olympic coverage was overshadowed by the political climate in Mexico City. As a result, “ABC reduced its live coverage because of anxieties regarding how its audience and sponsors might respond to any protests it aired,” Vogan said. When John Carlos and Smith’s raised their fists during the national anthem, ABC’s cameras almost missed it. After Smith’s and Carlos’ expulsion from the Olympic Village, they nearly disappeared from all media until ABC’s reporter Howard Cosell found Smith at the Diplomat Hotel. Cosell then persuaded Smith that he needed to make his perspective known. “The journalist’s on-air work with and publicly expressed sympathy for (Muhammad) Ali eased Smith’s trepidation and compelled him to join Cosell for a one-on-one conversation at ABC’s Mexico City studio,” Vogan said. Most of the innovations that we see today like live and color television, slow motion and split screen wouldn’t have come along when they did without Arledge and Trachinger.